We're a little late getting this news to you, but better late than never! You might remember the wild sea otter mother who gave birth to her pup in the Monterey Bay Aquarium's Great Tide Pool in December 2015. Well, it's happened again! Another wild sea otter has used the shelter of the aquarium's outside pool to safely give birth to her pup! The two have since gone back out into the bay for food. 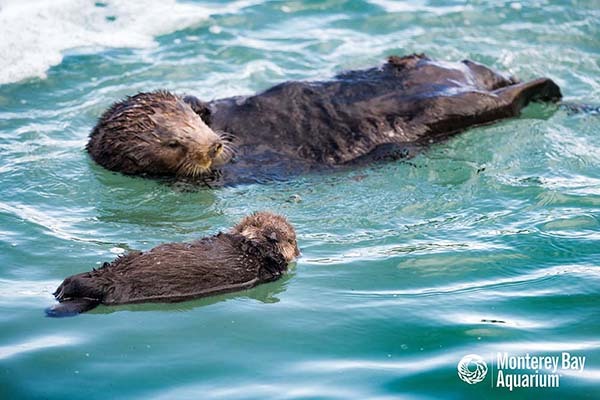 As the aquarium notes, "You’ll notice that mom starts grooming her pup right away to help it stay warm and buoyant—a well-groomed sea otter pup is so buoyant it’s practically unsinkable!... Our sea otter researchers have been watching wild otters for years and have never seen a birth close up like this. We’re amazed and awed to have had a chance to witness this Monterey Bay conservation success story first hand in our own backyard. Welcome to the world, little otter!"